"Build your own system, base starts as keyboard tray only". Single Mouse Keyboard System or Dual Mouse Keyboard Platform. Dimensions: 19" W x 8.4" D.
We offer a full line of premium mechanisms, keyboard platforms, mouse platforms and palm rests to meet the needs of a wide variety of individuals, workstations and office environments. Each of our platform options is designed to ensure that users type and mouse within their Neutral Reach Zone, thereby encouraging safe, sustainable working postures. By combining these elements, you will create the most non-intrusive, intuitively adjustable keyboard support available. If your needs are not met by any of our standard options, we can create a solution customized to your specific requirements. All of our keyboard and mouse platforms are made of phenolic, an ultra-strong, remarkably thin (1/4") composite that`s non-toxic, durable and easy to clean. 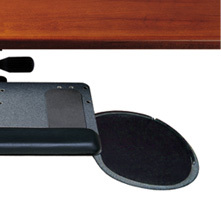 Standard Compact 950 platform is designed to support nearly all standard keyboards and to fit most desks. Available with any of our mouse options. Dimensions: 19" W x 8.4" D.
Keyboard Systems - In many ways, a keyboard support is the heart of an ergonomic workstation. As reach and vision drive posture, an articulating keyboard system allows the user to sit in a healthy, neutral posture through bringing the keyboard and mouse to the user. A well-designed articulating keyboard system offers protection from carpal tunnel syndrome, neck and back pain and other musculoskeletal issues. Since 1995, Humanscale has been the leading manufacturer of articulating keyboard systems and today sells more than all other manufacturers combined. Effortless Use - Humanscale patented keyboard systems have effortless height and angle adjustment. Promoting negative tilt keying, the keyboard platforms will not go into a positive tilt. Durability - Humanscale keyboard trays are solidly anchored to any work surface, and shape to specific user needs. Hypoallergenic Gel palm supports offer height and durability, and are designed to be compatible with human skin. Customization - Humanscale offers three negative-tilt keyboard systems, from 5G to our latest 6G, which combines easy dial-a-tilt and height adjustability with the strongest, most stable arm on the market. Humanscale keyboard supports come in many different configurations, including left/right customization, to support any user need. Design Story - An ergonomically designed keyboard is essential for every workstation. Ergonomists agree that the healthiest typing posture is one that allows the wrists to maintain a neutral or slightly pronated posture - straight or bent at a slightly downward angle. For that reason, Humanscale designers created our keyboard systems to allow the keyboard to positioned anywhere from 0 degrees to a -15 degree angle. Unlike older generation keyboard/mouse solutions, our platforms are designed to ensure that nearly all users are able to work consistently within their Neutral Reach Zone, and thus maintain a low-risk, sustainable posture. 11" Track For real small Desks at least 11" deep "from front to back"
14" Track For real small Desks at least 14" deep "from front to back"
16" Track For real small Desks at least 16" deep "from front to back"
18" Track For smaller Desks at least 18" deep "measure from front to back"
21 3/4" Track (Standard) For use with 22" deep Desks "measure from front to back"
25" Track For deeper Desks with up to 25" depth "from front to back"
27" Track For real deep Desks with up to 27" depth "from front to back"
Clip Mouse - The only mousing platform that lets users adjust their mousing position in all three dimensions for maximum comfort. 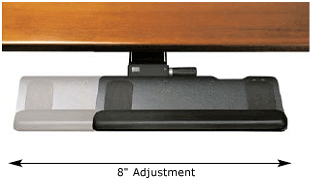 With height, depth, lateral and tilt adjustability, it can be positioned where it is needed for truly custom support. It can also be easily moved from one side of the keyboard to the other for left- or right-handed use. Height - Clip Mouse platforms model 90 and 91 can be in one of the two positions. Position one is parallel and to the side of the keyboard. Second position is approximately 1.5" above and over numeric keypad/keyboard. Clip mouse adds minimum of 4" to maximum of 10" to either side of the keyboard platform. Clip mouse is not recommended for In small and tight areas areas such as small cubicles. Clip Mouse - 90D Platforms "for both hands"
Swivel Mouse - Attached to our standard keyboard platform, which is designed to support nearly all standard keyboards, the swivel mouse provides a wide range of adjustability within the Neutral Reach Zone. 8 or 10-inch platforms are available in left, right and dual positions. Swivel Mouse - 11D Platforms "for both hands"
M2 Mouse - A unique platform solution that provides maximum keyboard accessibility without minimizing the size of the mousing surface. Recommended solution when the numeric keypad is infrequently used. 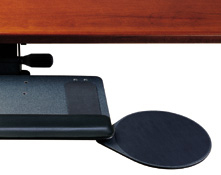 M2 Mouse - 81D Platforms "for both hands"
Humanscale Lateral Slider allows the platform to be adjusted left or right a total of 8" for optimal keyboard positioning. It can be ordered with any keyboard mechanism by indicating "LS" after the mechanism code (e.g., 6GLS or 6GWLS). Available with either a foam or gel core, our synthetic leather palm supports are comfortable, durable and easy to clean. Our standard palm supports are available in black. However, as with our platforms, other colors can be made available on request. DE100 - 29.5" x 12.188"
DE400/450 - 38.5" x 13.75"